It's done! After more than a year there is finally a brand new version of the well-known and popular server stack MAMP and the professional configuration tool MAMP PRO: Version 1.8. (download page) - and of course ... this version of MAMP & MAMP PRO is indeed compatible with Mac OS X 10.6 Snow Leopard. Though, until I get to the new features and improvements, I'd like to announce that the complete development of MAMP and MAMP PRO has been taken over by appsolute GmbH since August 2009. The best thing is that all developers who where involved with these applications in the past are again part of the MAMP team. To increase the availability of the website and the bug tracker, we've already moved them to new and more powerful servers. We're still working on the 1.x branch of MAMP, but the new version 2.0 is already on our roadmap for the near future. You may have noticed the two different versions of phpMyAdmin. That's because the current version does not run on PHP4 any more, so there is now a different version each for PHP 4 and PHP 5. We've also included the great Xdebug extension for PHP, created by Derick Rethans. It is a great help on debugging your web applications to locate and eliminate memory leaks and other errors. A MUST for every PHP developer! Another focus of this release is the stability of MAMP and all it's components. We continuously test MAMP and MAMP PRO since we also use them as a development environment for our web development projects. So usually it doesn't take long until a MAMP developer gets informed about a new bug and fixes it. We've also added a few maintenance utilities for the MySQL database server and its tables to MAMP PRO as well as to the free MAMP, they are located in a menu called "Tools". 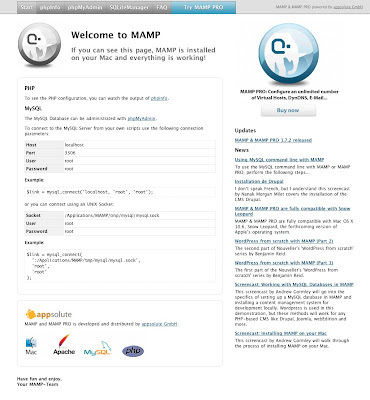 The MAMP start page also has been completely redesigned and considerably improved by adding an additional sidebar containing more informations about new updates as well MAMP tricks and links to interesting web development resources on the web. The MAMP Dashboard Widget has been slightly redesigned and fixed some minor bugs. You can find detailed informations about how to upgrade your current installation (up to 1.7.2) to the new 1.8 release as a PDF document within the disk image, So there shouldn't be anything in the way of upgrading to this brand new release. Finally we want to promise that there will never pass a whole year again without any bug-fix updates for MAMP and MAMP PRO. In the future we will observe a much tighter time frame and significantly shorten our release cycles. As a small gift we offer you MAMP PRO at half price until the end of this week (2009-09-06). Just enter the voucher code "mamp-pro" (without the quotes) upon purchase to save 50%!